That's right coffee addicts! From May 7-16, 2010 visit any participating Starbucks between 3p.m and 5 p.m., and enjoy a half-price Frappuccino® blended beverage! 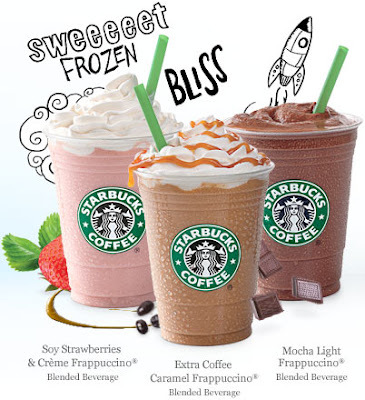 You can choose from one of three flavors: Soy Strawberries & Crème, the Extra Coffee Caramel, or the Mocha Light. Or, you can completely create your own using your favorite ingredients.